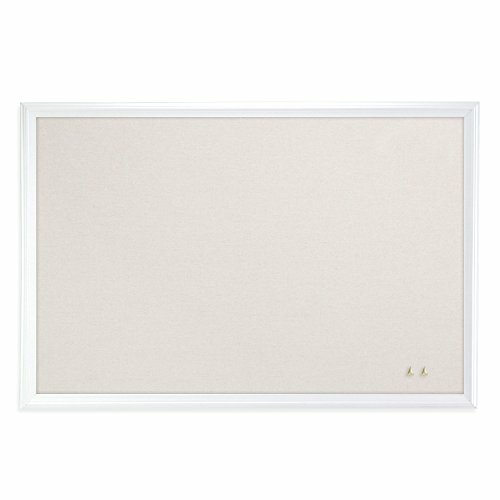 This modern white wood finish frame cork board is a perfect and functional solution to pin your notes and messages in any office, home or commercial environment. Use any push pins, thumb tacks or map pins to pin all of your notes, messages, pictures, memos, calendars, menus, reminders and more. Due to the dense board backing material under the board's cork surface, your push pins are firmly gripped and stay in place without falling out. The natural, self-healing cork surface hides push pin holes once the push pins are taken out. This bulletin board has a universal mounting system, as it can be hung vertically or horizontally to fit your allocated space. Mounting hardware and instructions are included for quick and easy mounting. The board is packaged with extra supportive corrugate material that is highly resistant to damage during shipping; all corugated material can be recycled once unpacked. U Brands cork bulletin boards are designed from the ground up with U in mind!